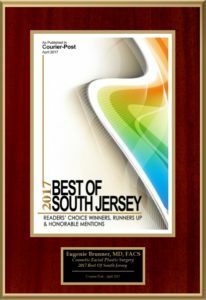 We’re excited to announce that Dr. Eugenie Brunner, our extensively trained facial plastic surgeon, was recently named “Best of South Jersey” in Cosmetic Facial Plastic Surgery for 2017 by the Courier-Post Readers’ Choice poll. This esteemed award is given to physicians who demonstrate excellence across a broad array of categories, as selected by patients themselves. Dr. Brunner is honored to be chosen for this distinction, and she hopes to continue to offer the best care possible in a nurturing and welcoming environment. Patients understandably want the best facial plastic surgeon they can find to help them achieve their cosmetic goals. To help them identify the ideal physician for their needs, the Courier-Post presents a list of patient-approved doctors as a resource for people in the Central and South Jersey area. This collection is intended to assist individuals in choosing a doctor that has the skills, experience, and compassionate nature to attain the desired outcome. If you’re ready to take the next step, let’s chat. Talk to our medical team today to schedule a consultation with Dr. Brunner.